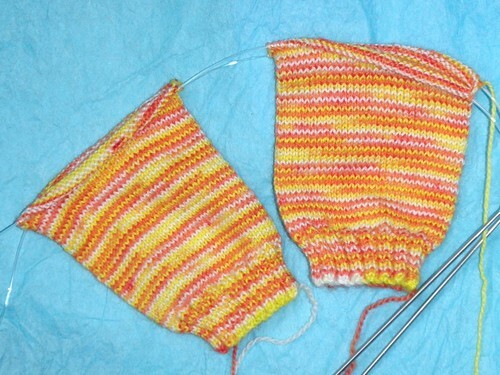 One of my 2014 knitting goals is to cut my WIPs in half. 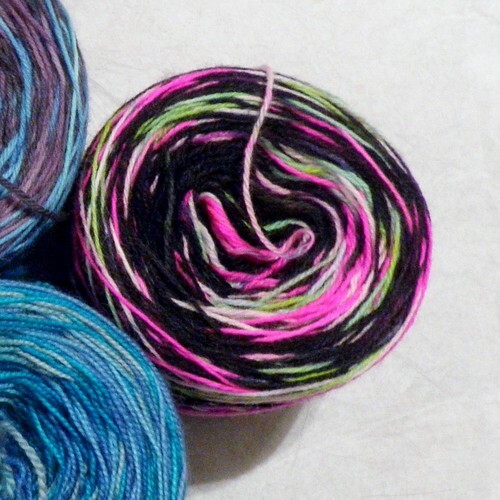 I am not a monogamous knitter, and I don’t want to be! I enjoy having projects going for various moods and knitting situations. 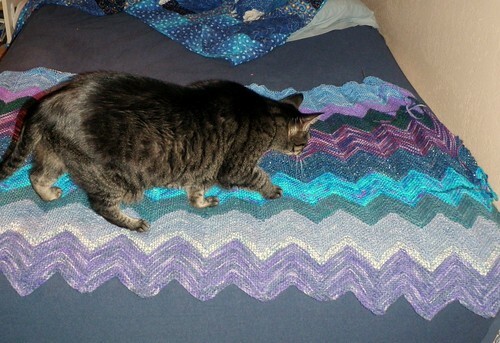 I can’t knit complicated lace and/or cables while watching movies, so I need a relatively simple project for that. At knitting group I can watch my knitting, but I don’t want anything *too* complex. Why did I put it down? What was preventing me from finishing it, and do I really want to finish it? If I don’t really want to finish it, I’ll go ahead and rip it out. If I do, I’ll try to figure out how to get started on it again so it can soon become a finished project! 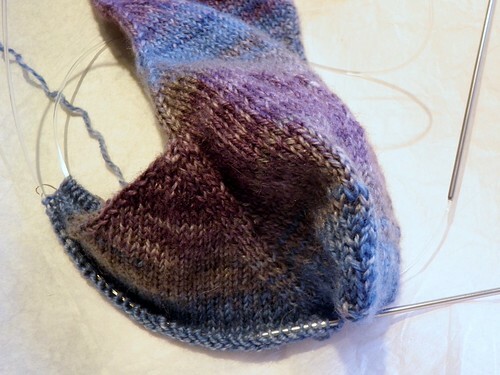 Today I’ll discuss one project that is no longer a WIP… my Lucy Hat. My friend Karen was wearing one that she knit, and I tried it on and thought it actually looked cute on me unlike most hats. I decided to knit one for myself. For the Lucy Hat I really don’t have a very good answer to this question. I’m pretty sure I was knitting it at movie night and started the crown decreases, and then the hat became too small for the 16″ circular needle and I needed to switch it to DPNs or Magic Loop. The thing is, I could have done this as soon as I got home. I own both DPNs and a longer circular in size 6, which is what I was knitting on! But… I didn’t. The answer here is pretty silly. I think the only thing really preventing me from finishing it was that it was out of sight zipped up in a project bag. 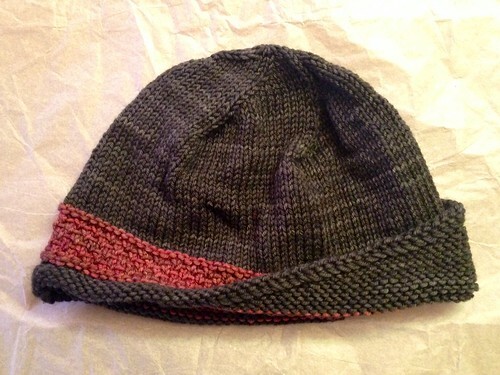 There was really no problem with the hat, and I had the needles necessary to finish it. So today I opened up the bag, grabbed my longer size 6 circs, and had the hat finished in less than 30 minutes. 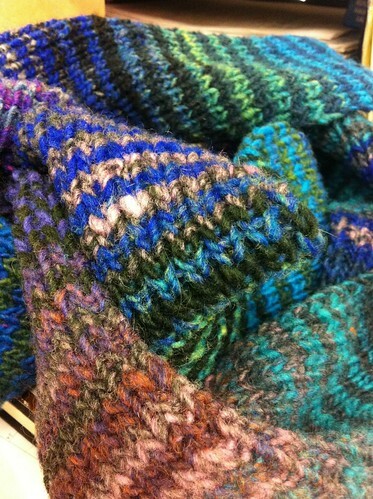 That included finishing the decreases, weaving in ends, and tacking down the brim. It’s a little crumpled because of its long stay in the project bag, but nothing a little blocking won’t fix! One down, ~36 to go. 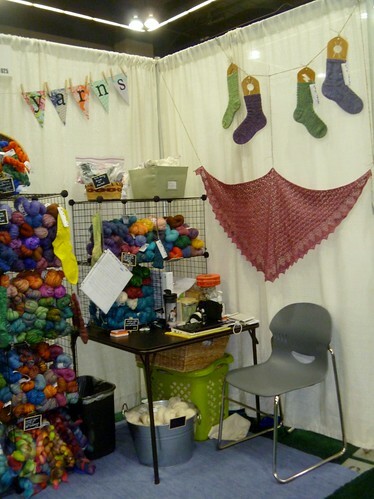 My knitting group companions Erin and Jessica of the Doubleknit Podcast have decided that 2012 is the year of FFS – the Finish, Frog, and Slog along. I started these plain socks for Halloween, but as you can see it took me a while to get to them. 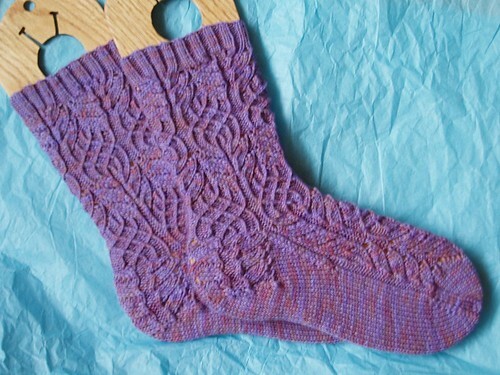 I like wearing plain stockinette socks, and I have a lot of variegated yarn, so I try to keep some going most of the time. 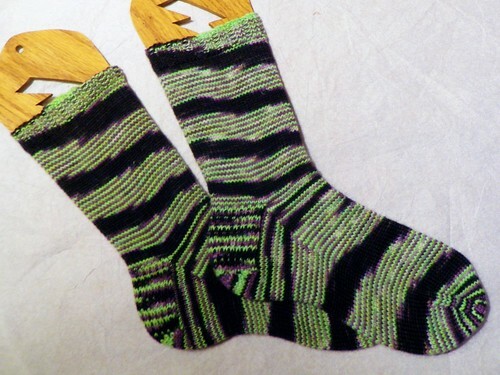 And is making some interesting striping socks, which I’ll show you in a bit! 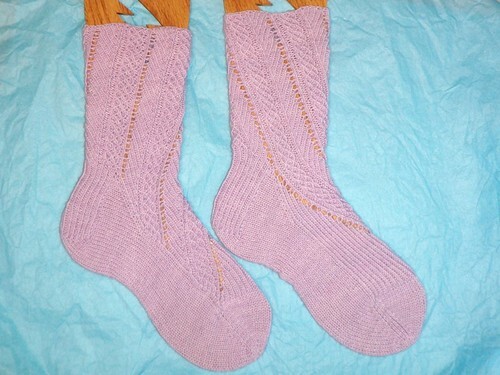 I’ve also been putting in some time on some languishing non-sock projects, but more on that later. I went to a holiday party for my knitting group, and a couple of things happened. It’s about 130 yards of Romney, and although it says 11wpi, which is a worsted / aran weight so it will be perfect for my big Chevron blanket*. So, just shy of 3 years later I have finally finished my scarf! I feel pretty silly admitting that, but I just don’t often get into the mood of knitting something in 1×1 rib. Now that it’s done I’ve been wearing it most days! 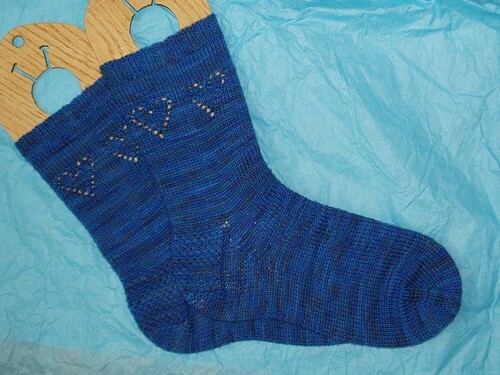 Then while traveling for the holidaze, I finished a much more recent project, Melanie’s 2011 Birthday Socks. Melanie modeled them and had the idea of posing with the lights leading from the tree to the plug, so we did. 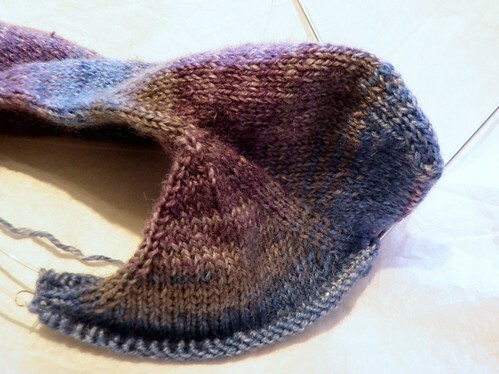 Skew is one of my old WIPs, Started February 12, 2010 – let’s hope I finish it before it’s 2nd WIP birthday. Shortly after starting it, I heard a lot of people were having problems with the fit. And, given my very high instep, I worried. Then I learned about the high instep mods on the designer’s blog, and a KAL for Knitty patterns inspired me to work on it more. 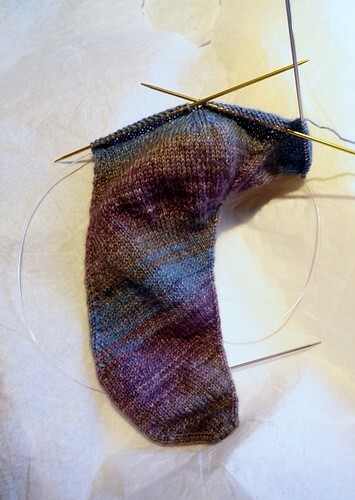 I think for me, the issue was that the sock is simple, but not *that* simple. It requires a bit of concentration, but doesn’t have quite enough interest to hold my attention during the straight foot section. 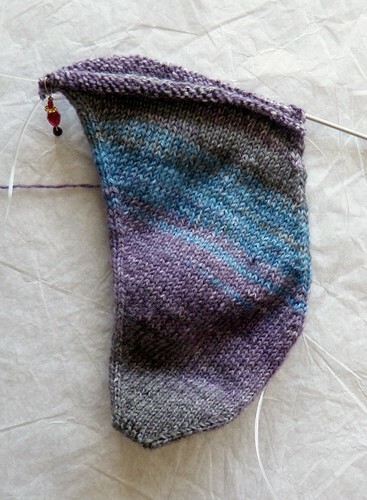 more increasing, and see the bump where the heel will go? I like my knitting either interesting or boring, this pattern is intermediate and switches back and forth too often for my knitting style. But after finding about the high instep modification, I was convinced to persevere. 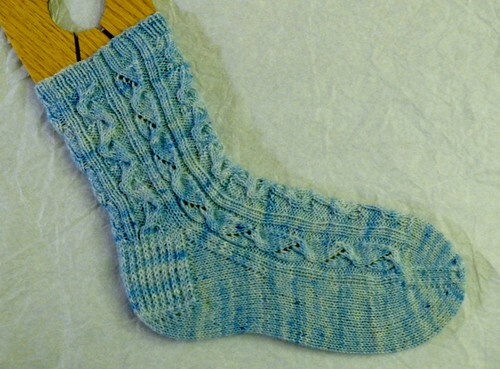 grafting the heel – hope you like Kitchener! Besides, I really wanted to figure out if this thing was ever going to become sock-shaped! 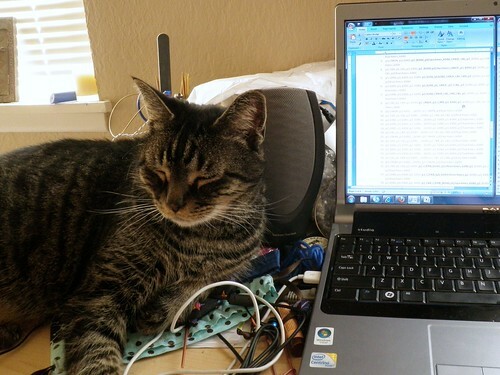 … but it fits, I checked. After finishing and mailing my secret and complicated project, I was glad to be able to get back to some simple knitting this weekend. 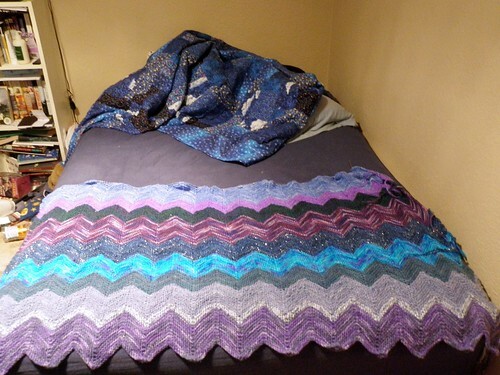 As you can see, it covers my double bed, and is almost halfway done length-wise! Java thought she would help me take the picture. Which was appropriate since her brother Pan was so helpful with my designing earlier. 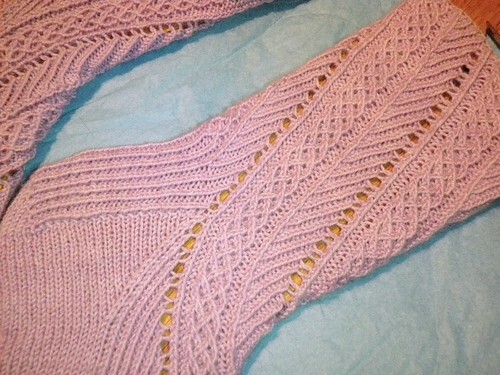 As for the post title… I’ve decided to knit from my stash this summer. No new yarn! 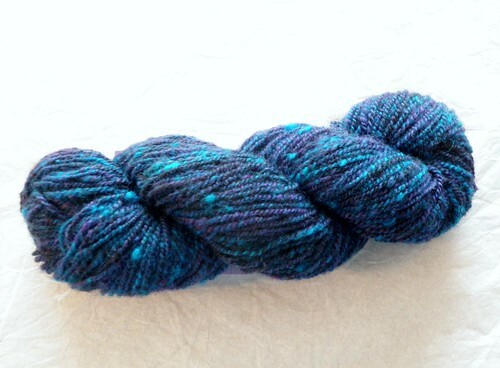 I have a lovely bunch of yarn already, and I just picked up some more on the LYS tour in May. I figured the summer would be a good time to focus on using yarn I already have. And because I don’t think I really showed it much after I moved, here is the stash in its home… the knitting nook. It lives there with my knitting books and patterns, my spinning wheel, and the little table that I like to photograph yarn and socks on. 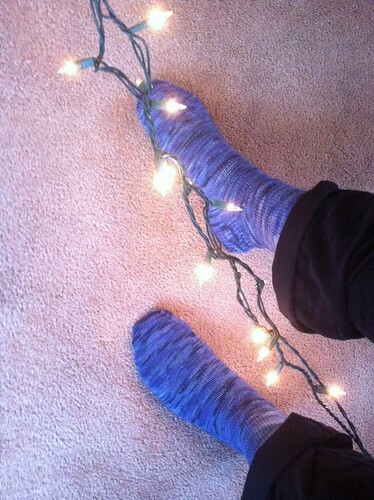 I finished my Nebula socks. Yes, it’s been a very long time. But, you see, I have second sock syndrome and it is a horrible condition. 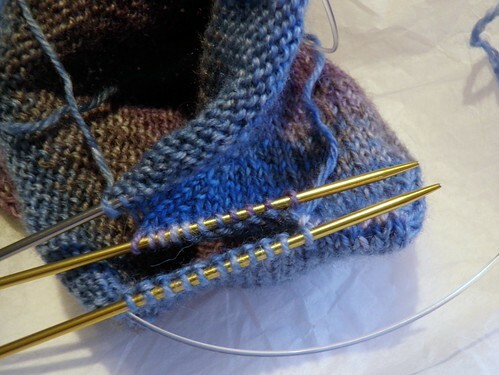 You may have noticed that I almost always knit my socks two-at-a-time on one long needle. There are a couple reasons for this – one being that then the socks turn out with exactly the same number of rows and have the decreases starting at the exact same moment and all those lovely things that make my perfectionist self unreasonably happy. 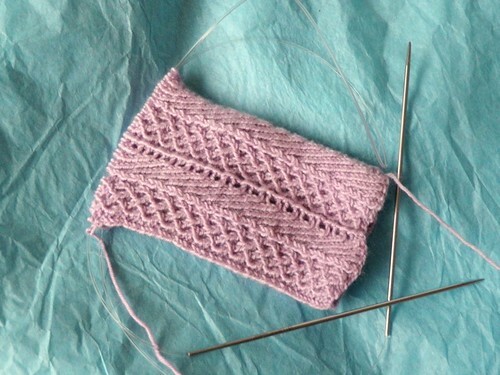 The other reason is that I can crank through a single sock in no time at all, but once it is complete it takes me ages to finish the second one. 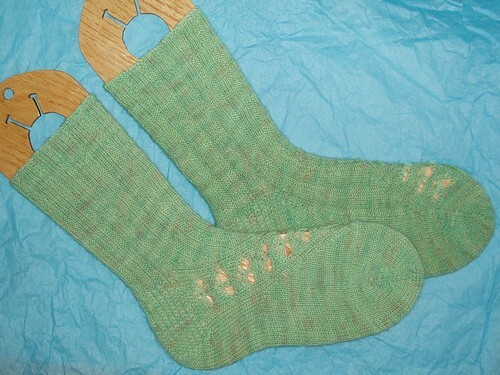 My Conwy socks took well over a year, if I remember correctly. 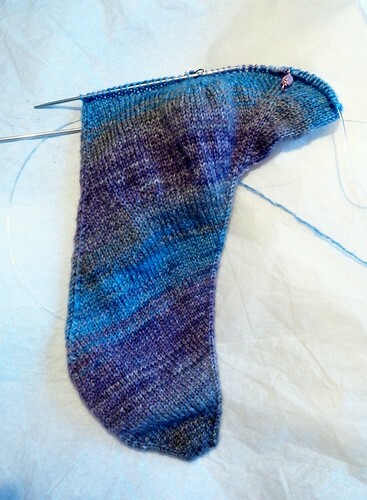 I have also found my Leyburn sock and partial-sock and am working on that too. Time to clear out those WIPs! Thursday evening I went to Stitch & Pitch. I learned that Seattle was the first city to do one, and I believe this year was the 5th. 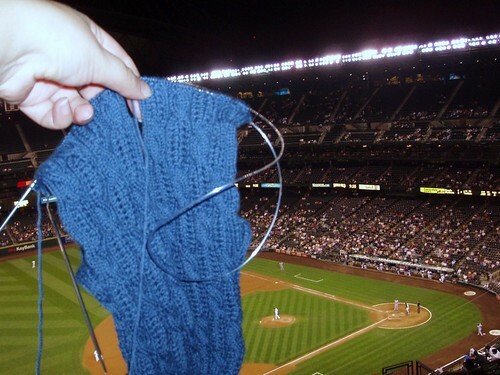 My socks had fun hanging out at the ball game. Then Saturday morning the same socks and I headed down to Salem. The socks got finished on the train! They fit! And I think she likes them! 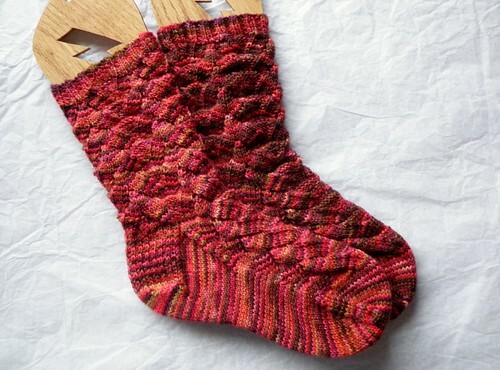 Now, my goal for Summer of Socks this year was to finish my sock WIPs. It’s ending September 1st, but I had been thinking that it ended at the end of the summer (September 22nd). 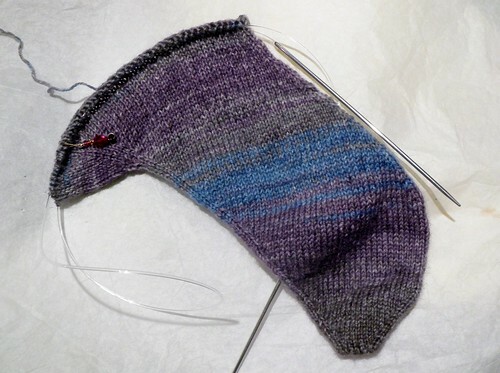 So, I’ve decided to continue working on sock WIPs for the rest of the summer. Well, it’s time to announce the winners of my contest! 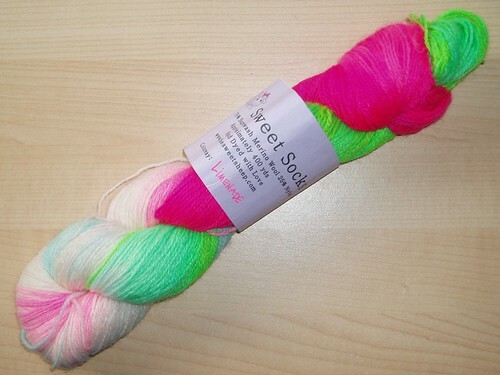 The first prize goes to MJ, who guessed 20 pairs worth of sock yarn – which is exactly how much I bought! She’ll be getting the Toe-Up book. There are two runners up who guessed 21. This is a “more correct” answer than 19 because I actually came home with 21 pairs worth of sock yarn, just one of them I didn’t buy and I realized the question for the contest was how much I bought, and also one of the 21 is not for me. This question was more complicated than I realized! 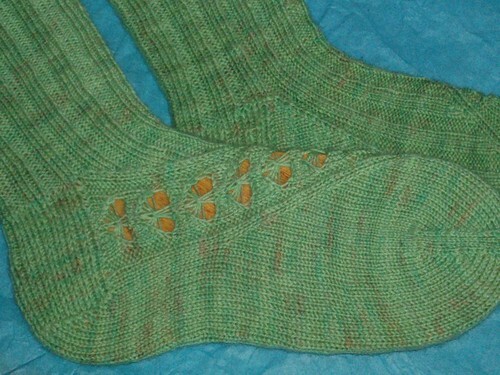 In the past few days I’ve also finished a couple pairs of socks. Sorry for the blurry picture, the beautiful twisted stitches don’t show up with flash and I apparently couldn’t stand still enough. 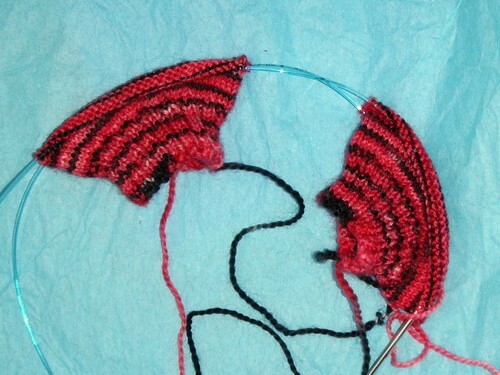 I started the Twisted Flower socks so long ago as twin socks with MJ, but I got distracted when I hit the heel flaps. Also, there is a 38 stitch by 49 row chart for the foot, and that requires a bit more attention than my usual knitting situations allow. But the past week or so I decided I’d go for it and put on an audiobook and just did it. And I’m so glad I did!